Boston can be a challenging place to navigate! Here you'll find maps and directions for getting around the downtown area. Protip: Leave your car behind, if at all possible! 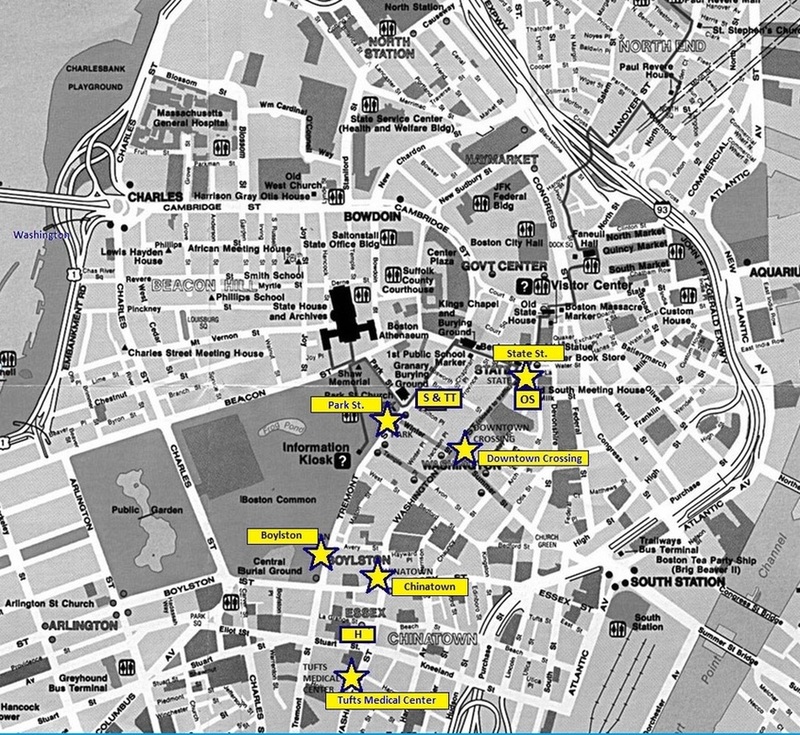 If you haven't planned yet how you'll get to town, see our Getting Here page. By far the best way to travel around downtown Boston is on foot or by public transit -- the Massachusetts Bay Transit Authority (MBTA or "T" for short). Getting in and out of the downtown area is easiest using the T system. If you're staying near Suffolk (see lodging options here), you probably won't need to even take the T again once you've made it downtown, as everything is within walking distance. To ride on the T, you'll need either a CharlieTicket or a CharlieCard (some buses take cash, but may not have change). The ticket is paper and can be obtained at a kiosk at any station, but it's more expensive per ride than a plastic CharlieCard ($2.65 versus $2.10). Thus, we recommend getting a CharlieCard, but they're only available at certain stations during certain hours, and a few retail locations around town -- a list can be found here. Both CharlieCards and CharlieTickets can be refilled at the kiosks. If you think you'll ride the T at least 10 times during your stay in Boston, it's a better deal to spring for a 7-Day pass ($19) than to pay for individual rides. See more fare information here. If you're coming from the Green Line, get off at Boylston if you're going to the hostel or Park if you're going to the venue. If you're coming from the Red Line, get off at Downtown Crossing to get to the hostel or Park to get to the venue. If you're coming from the Orange Line, get off at Chinatown or Tufts Medical to get to the hostel or Downtown Crossing to get to the venue. If you're coming from the Silver Line SL1 or SL2, get off at South Station and either walk to the hostel or transfer to the Red Line (see above). If you're coming from the Silver Line SL5, get off at Tufts Medical Center or Chinatown to get to the hostel, or at Downtown Crossing to get to the venue. If you're coming from the Blue Line, get off at State to get to the venue; from there, it's a bit of a walk to the hostel, or you can transfer to the Orange Line at State, then get off at Chinatown or Tufts to get there. 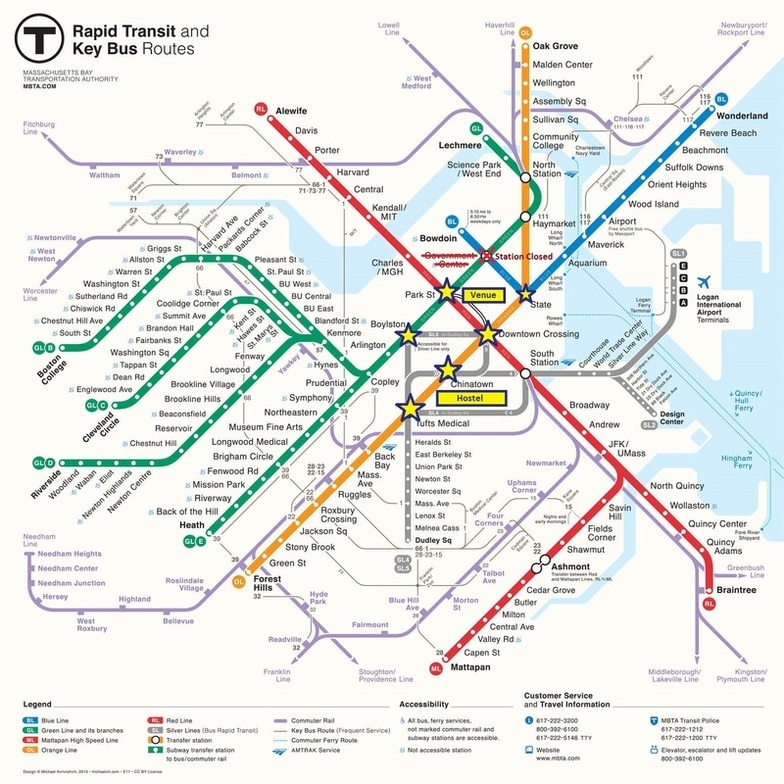 Check out the MBTA map below to figure out how to get around. Above is a subway map. Stars denote the closest stations to the official NEEPS hostel and the venue (Suffolk Law School). Tufts Medical Center and Chinatown are equidistant to the Hostel. Park Street is the closest stop to the Venue. A walking map of Downtown Boston. T stops are marked with stars, Sargent Hall and Tremont Temple (where most of the conference will take place) are marked with "S & TT," Old South Meeting House (where Steven Pinker's talk will be held) is marked with "OS" and the hostel is marked with an "H."
If you're sure you want to try driving around parking in downtown Boston (don't say you weren't warned), there are a number of high priced parking garages near Suffolk University. The closest one to the conference facilities is at 120 Tremont St. You can also use the Boston Common parking garage, which is a short walk away. Here is a list of the other parking facilities near campus, and a nifty Parking Finder tool at BestParking.com where you can find parking lots and compare prices (for a lot near the hostel, look in Chinatown or the Theater District).